He was hiding under the floorboards of the burned-down house. Earlier this year, a woman named Christine Marr got a call from a local firefighter while she was at work. He told her that her home had caught fire — and the first thing she thought about were her pets, Smoke, Chloe and Ringer, who were inside the house when the fire happened. 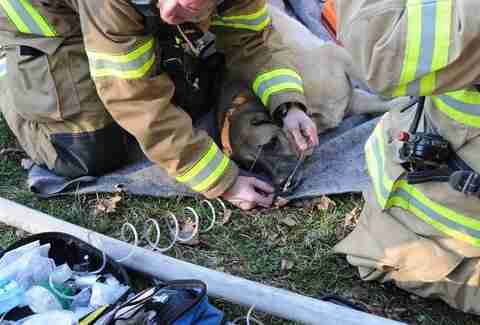 The firefighter told Marr that they’d found her dog, Chloe, lying on the floor of the room that she always went to whenever she was feeling scared or nervous. “They found her lying in the bathroom because that's always been her safe zone, so that's where she ran to during the fire,” Marr told The Dodo. 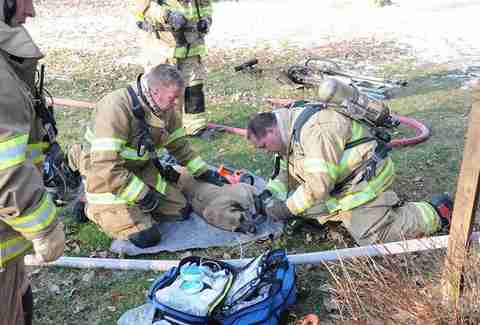 Firefighters told Marr that Chloe was in pretty bad shape, and had to be rushed to the vet right away. 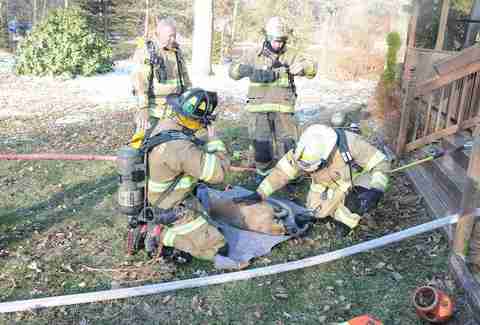 The firefighters hadn’t had any canine oxygen masks in their truck with them, so they used a human oxygen mask to revive her before rushing her off to get additional help. “She almost didn't make it. They said she was pretty much gone until they got to her with the oxygen mask,” Marr said. 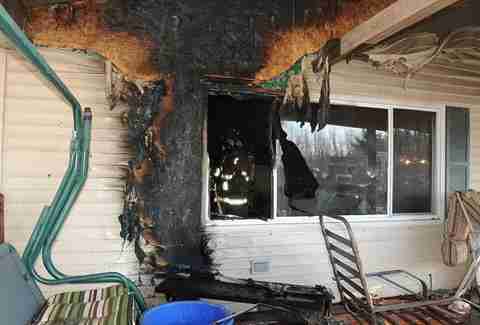 Firefighters had also found Marr’s cat, Smoke, inside the house, but unfortunately, she didn’t make it. 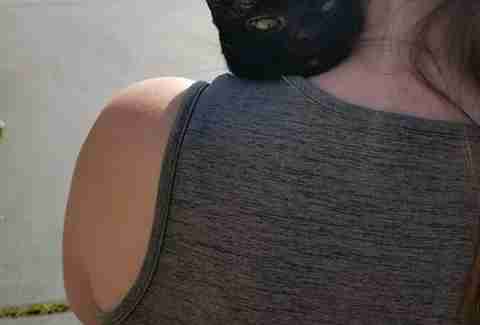 When Marr asked the firefighter about her other cat, Ringer, he said they hadn’t found another cat — meaning Ringer had most likely perished in the fire. This was particularly upsetting to the family, because Ringer and Chloe had always been the best of friends. 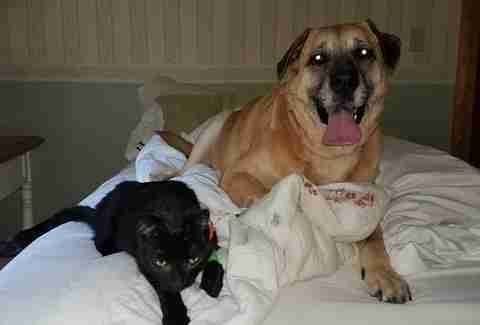 The cat and dog were both very shy around strangers, but around each other they’d always thrived. While Marr was absolutely devastated about the loss of her cats, she tried to focus all her attention on helping Chloe get better. Without the help of the firefighters, Chloe likely wouldn’t have made it, and after hearing Chloe’s story, the fire chief went out and purchased canine and feline oxygen masks for all the fire departments in the area, to help dogs like Chloe and her cat siblings in the future. In the weeks after the fire, Marr went back to her family’s burned home to feed the multiple barn cats that had been living on the property. Every time she went back, she searched and called out for her cat Ringer, just in case he somehow survived the fire and was still lingering around the house. As the weeks went on, however, Marr started to come to terms with the fact that Ringer was probably never coming home. On Mother’s Day, almost two months after the fire, Marr’s husband decided to take her back to the house — he had been hard at work restoring and repairing it. On a whim they decided to take their dog Chloe along with them, as the house was cleaned up enough for her to come inside and walk around with them. As soon as they got to the house, Chloe started intently sniffing the floor, which seemed normal to her parents — until she started licking and scratching it, too. As they moved through the house, they reached the dining room, where there was a large gap in the wall that led down under the house. Chloe immediately ran over to the gap and shoved her head inside it, and refused to come out. Every time her parents tried to pull her out of it, she’d just stick her head right back in, so Marr decided to investigate — and that’s when she heard meowing coming from inside the gap. Marr and her husband assumed that one of the barn cats had somehow gotten into the house during all the construction and had then gotten stuck. Marr took Chloe out to the car and then came back inside to help her husband try to figure out how to free whatever was in the floor. But what she saw instead was Ringer, rubbing and snuggling up against her husband, so happy to be reunited with his family. At first, Marr and her husband almost didn’t believe that the skinny, dirty cat in front of them was their beloved Ringer, but the little ring around his tail was proof that, somehow, Ringer had gotten underneath the floorboards and survived the fire. 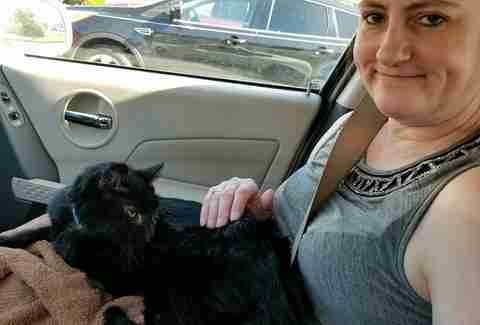 He’d been without food and water for nearly two months, so the couple scooped him up and quickly brought him out to the car to take him to the vet. As soon as they climbed into the car and Chloe saw Ringer, she completely freaked out, so over the moon to see her best friend again. “She was jumping up and down in the backseat, so excited, trying to jump up front to get to Ringer,” Marr said. After examining Ringer, the vet came out to talk to Marr and her husband and listened intently to Ringer’s story of survival. “He said, ‘This cat is a miracle. 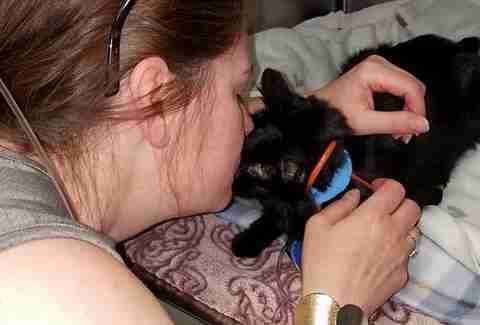 This cat is going to live,’” Marr said. Ringer is now back home with his family and recovering. Despite having a little trouble eating and drinking, he’s in good spirits, and his family is still amazed that he somehow survived the fire and made it home to them. Chloe is overjoyed to see Ringer back at home, and wants to spend every minute of every day by his side. “Chloe is so happy, and doesn't want to ever leave the room where he is,” Marr said.